in the ongoing cleanup and reconstruction efforts in western parts of the country devastated by heavy rains which left more than 200 dead and dozens of people missing. The government has launched a volunteer programme in collaboration with local authorities to organise deployments of the volunteers and distribute work reports Efe news. 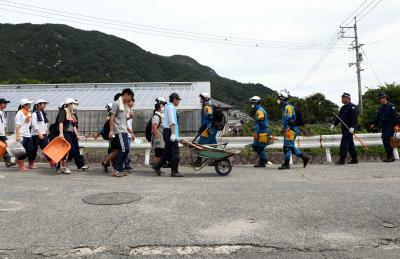 Some 40 volunteer centres have been established in the prefectures of Ehime Okayama and Hiroshima located in western Japan where the rains caused maximum havoc to manage the efforts of the nearly 18 000 volunteers. The record torrential rains falling since July 6 in almost half of the Japanese archipelago have so far left 204 dead and some 40 missing according to the latest official data. Some 160 homes were destroyed and another 700 suffered significant damage from floods and landslides triggered by the rains while some 5 800 people continue to be evacuated. The precarious condition of the terrain due to numerous landslides coupled with the areas that are waterlogged are hindering road access to many of the affected locations complicating the search for the missing and assistance for evacuees.